Dimensões desta antevisão em PNG do ficheiro SVG: 535 × 600 píxeis Outras resoluções: 214 × 240 píxeis | 428 × 480 píxeis | 685 × 768 píxeis | 914 × 1 024 píxeis | 1 160 × 1 300 píxeis. Coat of arms of the Holy See with gold key in bend as described in Donald Lindsay Galbreath, A Treatise on Ecclesiastical Heraldry (W. Heffer and Sons, 1930), p. 9; Bruno Bernhard Heim, Heraldry in the Catholic Church: Its Origin, Customs and Laws (Van Duren 1978 ISBN 9780391008731), p. 54; Heraldry Society of Great Britain; Michel Pastoureau, "Keys" in Philippe Levillain, The Papacy: An Encyclopedia (Routledge 2002 ISBN 9780415922302), vol. 2, p. 891. 20h57min de 6 de setembro de 2012 1 160 × 1 300 (253 kB) Fry1989 This was already discussed in the DR and three people all say you're wrong, revert again and it goes to AN/U. 20h47min de 6 de setembro de 2012 1 160 × 1 300 (357 kB) Esoglou Reverted to version as of 00:37, 6 September 2012 by User:FleetCommand. Please take it to the Talk page. 00h37min de 6 de setembro de 2012 1 160 × 1 300 (357 kB) FleetCommand Okay, Wikipedia says Coat of Arms of the Holy See has the gold key in ''bend'' and the silver key in ''bend sinister''. 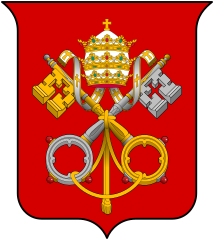 (It is the opposite for the Coat of Arms of the Vatican City.) So, here it is. Please don't mind me. Proceed with your edit warring.